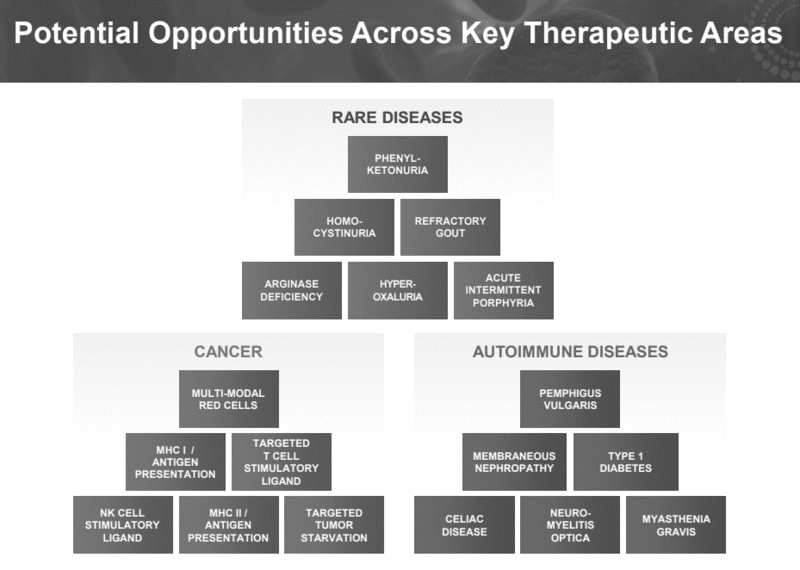 Many, if not most, venture-backed biopharma companies don't just have one product targeting one disease. They generally have several products, each of which may target multiple indications, or they have one product that is a "pipeline in a product" capable of treating a host of diseases. If you are a platform company, describe your technology. If you are a product company, describe your core scientific insight, and describe how this insight can yield multiple products, or how your product can be a "product in a pipeline". Following are examples of each. Here I'll use the example of Rubius Therapeutics again. They are one of the most successful preclinical companies to go public recently, and their market cap is currently ~$2B (Rubius was founded in 2013). As a caveat, I'll mention that some of these slides are fairly detail-light, and some come off a bit strong in terms of what they claim the platform can do versus the data they present on the slides. As long as you can back up these claims with data later in the slide deck, it is fine to provide the "bottom line on top" to give the audience a sense of what you're working on before delving into the details. However, it's never a bad idea to include a bit of data upfront to support each claim, before a more detailed discussion later. 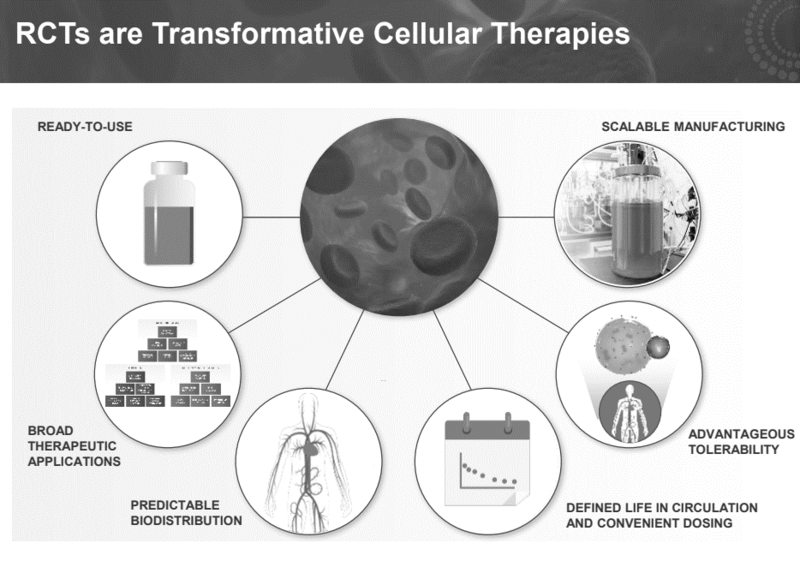 Rubius has a unique cell therapy platform. 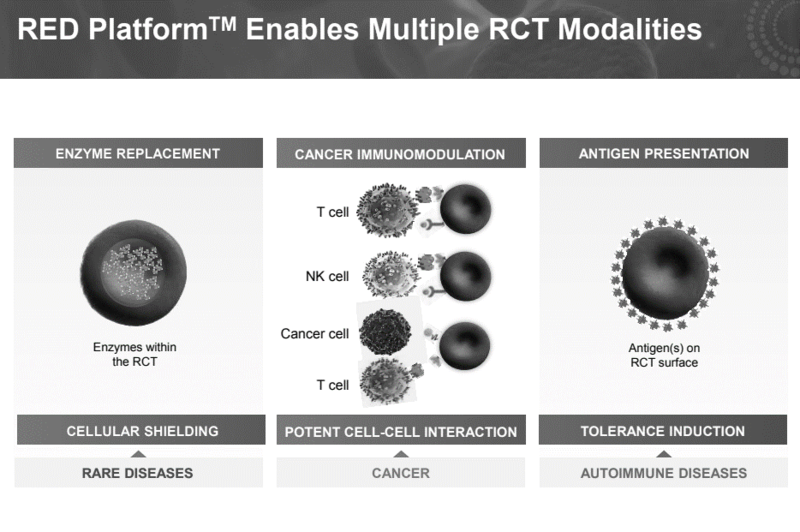 Current cell therapy technology suffers from many limitations, and Rubius' platform overcomes many of these and provides a few additional benefits. The above slide sets the stage for their technology description by describing some of the biologic insights that led to the creation of their platform. For someone familiar with cell therapy, reading this would probably be something of an "aha" moment: this seems like an overlooked cell type, but one that could be a durable, safe, and logistically manageable (relative to CAR-T cells) source of cell therapy. This is the overview of their platform. There are almost no details here, but because this is a pretty different type of platform, it is worthwhile to have a simple slide like this to orient the reader to the platform. Describe your platform to some of your friends who are in the field but may not be familiar with your specific tech, and if they are confused, simplify until most everyone intuitively gets it. That doesn't mean everyone needs to understand it, but your target audience needs to get it. 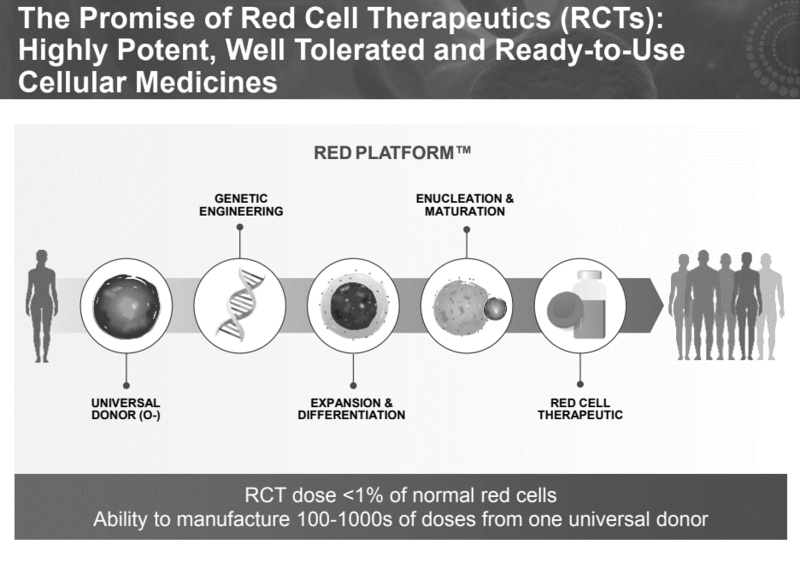 This slide calls out a few specific features, namely that a universal donor can supply a lot of doses -- which is a huge advantage over CAR-T therapies, where you need to extract cells from every patient you need to treat. 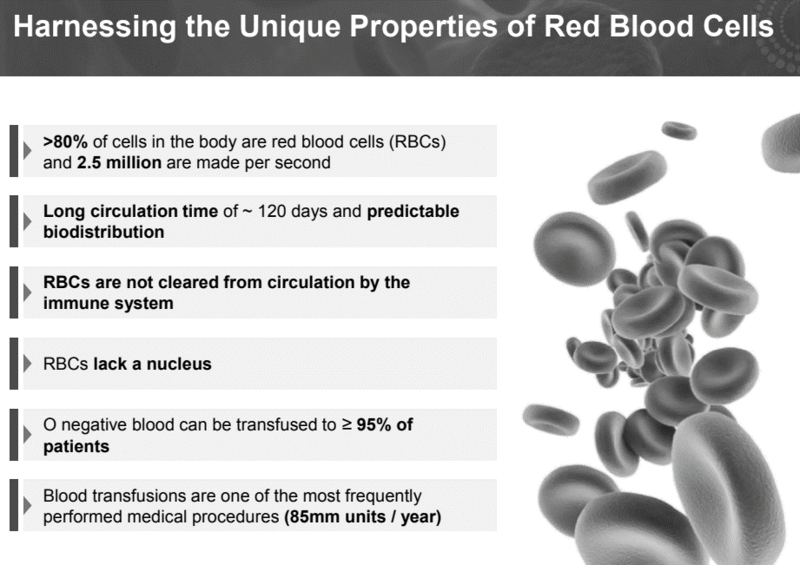 It also mentions that cells per dose is under 1% of the total red blood cells in the body -- I'd imagine this is important because it shouldn't interfere too much with the normal function of your red blood cells. I personally found this slide a bit busy and confusing (at first I didn't realize the "software" was just a metaphor), and it sort of seems heavy on hype, but it is important in that it explictly describes the benefits of the platform: it is universal, versatile and efficient (ie fast -- getting from idea to lead product in 9 months is way faster than getting from idea to lead with traditional small molecules or biologics). It doesn't matter how interesting or novel your platform is if it doesn't provide any practical benefits vs. other platforms. You need to describe why your particular platform is the best. This slide also suggests the platform has an inherent "flywheel" effect that provides a barrier to entry: the more you work with the platform, the faster you're able to make new products, and you'll continually build an IP moat. The company would need to support these claims with evidence later in the deck, and again, this particular presentation comes off a bit strong to me, but it is important to clearly communicate the benefits of your platform. Describing the benefits is so important that they added a second slide to emphasize them. 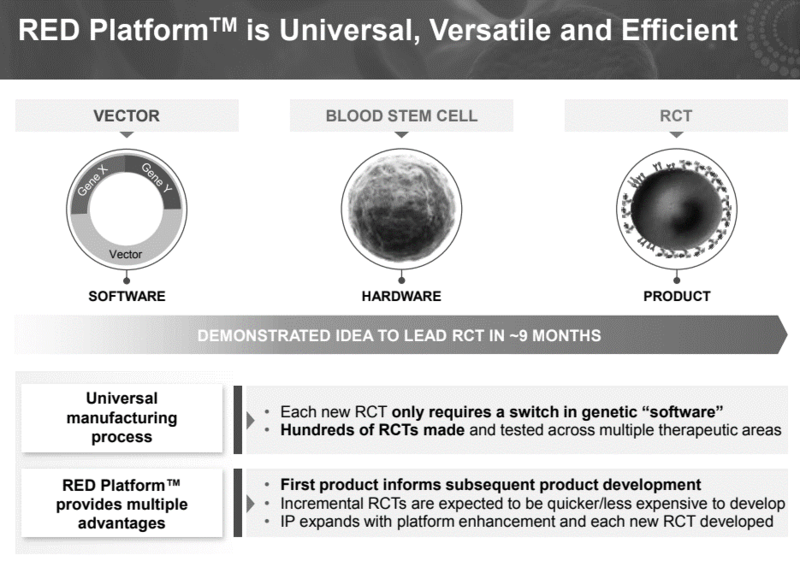 This is sort of a "platform to product" slide. They don't just have this great platform, but it's actually a product engine, and they've identified a few therapeutic areas that are a great match for their approach. Figuring this out can be a big challenge for platform companies. There's a stage where you may not want to focus on just a few applications, because it seems like a shame to ignore all the other cool stuff you can do. And there's also the fear of picking an initial application that doesn't work out. But it is really important to figure this out, and, based on my review of the biopharma VC deals of 2018 thus far, you probably won't raise a Series A until you pick a lead product and make some progress developing it 1. This slide just zooms in on the previous slide and identifies some specific diseases that Rubius' platform could treat. The next slide in Rubius' deck, which I won't show here, is the pipeline slide that I use in the "Pipeline & products" post. The following 20 slides in their deck all describe Rubius' various products. If you have products, focus on them as much as you can. Once you find a really good product, the value of the product tends to outweigh the value of the platform. Many many multi-billion-dollar biotech companies have been built around just one product, or only have one product. Allakos is one such company, and is the subject of our next example. Allakos went public this July at a ~$750M market cap and is trading at $1.7B as of early September 2018. 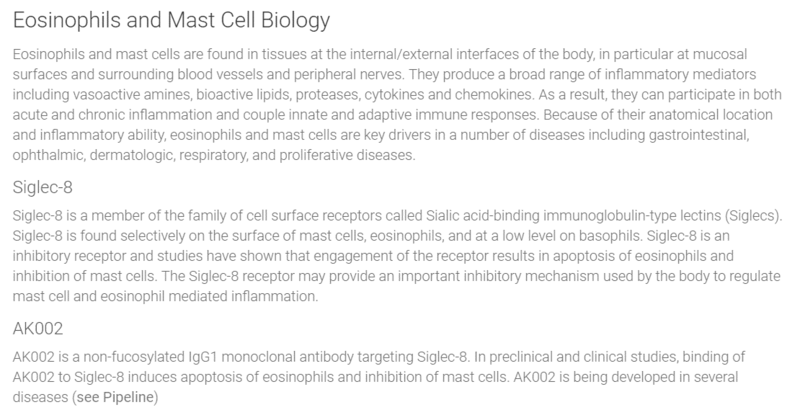 Allakos has one product an antibody in Phase 2 targeting Siglec-8 (they may have other earlier-stage ones, but I don't see them on their website). This is one of those "pipelines in a product": the product is in clinical studies in four indications, and probably in earlier stage studies for several other diseases. Siglec-8 is a surface receptor found only on a few types of immune cells. 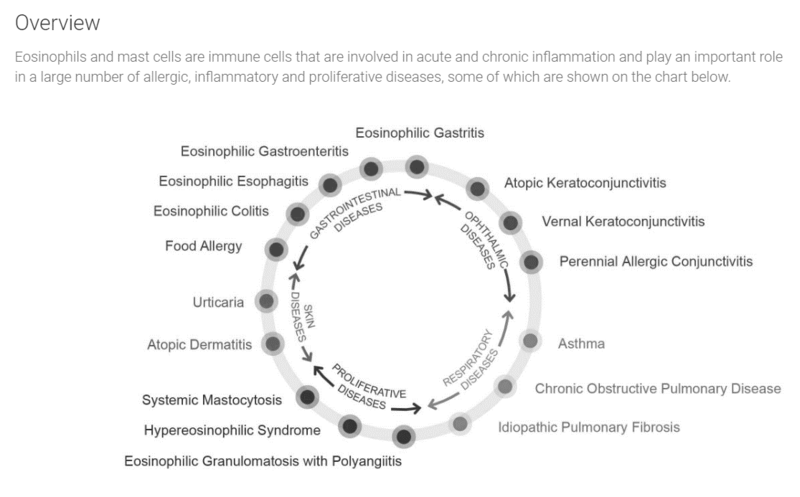 Siglec-8 expressing immune cells play important roles in a variety of diseases. This makes for a "pipeline in a product". If you are a product company based around a single target, think about whether you can make a case that your product could be a "pipeline in a product" as well. Not only does this increase the ultimate value of your product, but it gives you multiple "shots on goal": if for whatever reason your product doesn't work in one disease, it could work in others. You'll also need to describe your target and product. If you are earlier stage, and if your target is novel, you can include more description here, and ideally some data validating your target. Describing your molecule is also important. I'd assume based on Allakos' market cap that is has either one of the most advanced or one of the best Siglec-8 inhibitors (though I don't know anything about Siglec-8), but for an earlier-stage product, having some data on why your molecule is the best is important. Read part four, Development plan, here. 1I think one of the reasons that biotech VCs favor experienced founders is that picking the right initial products is such a complicated and cross-disciplinary effort. It requires understanding the science behind your core technology, the benefits and limitations of your platform compared to others, the unmet need and clinical landscape across dozens of diseases, and the molecular biology of each disease (among many other things). If you've been leading drug discovery efforts for decades, you'll have an instinct for this, and also have experience working with cross-disciplinary teams to collectively discover these insights. If you don't have all this experience, you can make up for it by recruiting a lot of smart people from various disciplines to help you.